Since its first season, HBO's Game of Thrones has preyed on the emotions of its fans, causing them to cry out and howl in anguish at each shocking twist. Watching the show each week can be a fraught emotional experience -- death is often swift and brutal in Westeros -- but it's not exactly easy on the actors either. 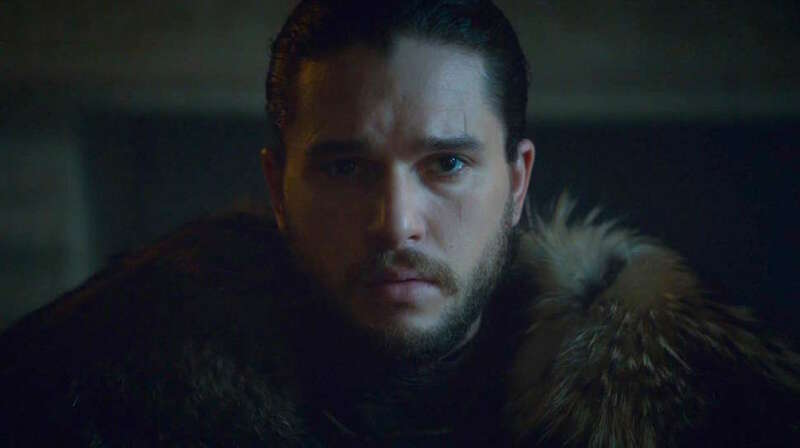 According to Entertainment Weekly's new cover story, which offers a few mild hints at what's to come in the final season, actor Kit Harington, who plays the show's sword-wielding (and direwolf-loving) hero Jon Snow, "wept" not once, but twice when reading the script and learning the fate of his character. Were they happy or sad tears? It's hard to say -- the article keeps spoilers to a minimum -- but it does note that Harington had not read the script when the cast assembled for the first table read at the production offices in Belfast. (Others, like Emilia Clarke, rushed home to read the password-protected scripts the second they appeared in their inboxes.) Instead, Harington discovered what awaited Jon Snow as the script was read aloud. "What’s the point of reading it to myself in my own head when I can listen to people do it and find out with my friends?" Harington explains in the article. Fair enough! The 31-year-old actor wouldn't reveal what made him cry the first time, but apparently the second time was when he reached the last page of episode 6, the finale of the entire series he's worked on since it debuted in 2011. "Every season, you read at the end of the last script 'End of Season 1,' or 'End of Season 2,'" he says. "This read 'End of Game of Thrones.'" Harington was not the only cast member moved by the end of the series. In EW's piece, Sophie Turner describes reading the scripts as "completely overwhelming” and says it left her feeling "numb." Similarly, Lena Headey, who plays the sinister Cersei Lannister, described the experience of filming the final season as leaving her with "a great sense of grief." What exactly could make all of them so stressed out? Again, the article is light on spoilers, but it does note that there was a 55-day night shoot for a (presumably) climatic battle. (For some context, Season 6's "Battle of the Bastards" required a 25-day shoot.) "It’s brutal," says Peter Dinklage in the article. "It makes the Battle of the Bastards look like a theme park." Then again, as exciting and grueling as the epic action sequences on Game of Thrones can be, the most moving parts of the show tend to be smaller character moments. In the piece, EW writer James Hibberd, who visited the set in Belfast, describes arriving on set and being "stunned" and "freaked out." Specifically, he notes, "There are characters in the finale that I did not expect." Could Sean Bean be back as some sort of exposition-delivering ghost figure? Is this the Lady Stoneheart reveal some fans have clamored for? Did Grey Wind return from wolf heaven? We're going to have to wait until 2019 to find out exactly how it shakes out. If Kit Harington's tears are any indication, start investing in new boxes of tissues now.